The color of your floors can be changed by the sanding process. Sanding produces dust clouds, fine dust and particulate matter, which can linger in your home or apartment for days afterwards. Sanding creates a mess and can be significantly costly. Floors refinished with zero mess or odor. 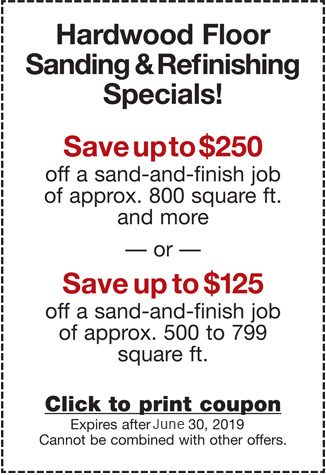 Costs half as much as traditional sand finishing. Whether your floors have been scuffed, scratched, gouged, or dulled down by years of use, the RX for Wood Floors process can vanquish contaminants, restore the surface and finish, and save you time and money. Here is a breakdown of the three steps involved. (The professionals at Elegant Floors can perform this refinishing process for you in just one day). Before refinishing the floors, technicians will identify and repair damage to the floors, such as scuff marks, scratches (from pets or furniture legs), gouges (often found in heavy traffic areas), and other unsightly marks. A specialized catalyzed wood finishing process leaves your floors looking attractive, beautiful, and clear – for years to come. If you’re interested in learning more about the RX for Wood Floors process, connect with the professionals at Elegant Floors for a free estimate. We are a family-owned business; we’ve served the Bay Area Peninsula for years. Contact our Mountain View, CA offices for more information at 650-961-1339, or explore resources and videos at www.elegant-floors.com. Visit us and like us on Elegant Floors on Facebook!